In a new solo exhibition at Postmasters Gallery in New York’s East Village, Rafaël Rozendaal reflects on digital image-making - the links between digital forms, language-making, and art practice. Opening on 12 January and running until 23 February, the exhibition is the artist’s fourth solo show at Postmasters. Don’t Do Too Much presents a group of ‘shadow objects’ - forms which exist in, and disrupt, the zone between image and object. The works are shapes, generated using code, and cut from white steel by software communicating with hardware. They are contemplative voids, spaces where the online world can be contemplated at a slight - but not complete - remove, silently suggesting powerful relationships between digital and physical dynamics. Code sends electricity through wires and cuts through metal, resulting in a shape and its negative. The negative - the space left within the work - is a link to the metal offcuts left behind. The negative is activated by the varying intensities and distributions of light in the gallery. Through these interactions, Rozendaal opens up dialogues between language, picture and referent and highlights the presence of the physical and digital forces shaping the work. Online and in digital environments, the illusion of dimension is produced by gradients and drop shadows, images can be inverted in a click, and white space is a key consideration. Don’t Do Too Much places these elements into a zone which, while clearly referencing the digital, is also powerfully physical. Rozendaal also reflects on digital making in practice and how it relates to the world of work and the idea of the artist as artisan. i don't really work with materials... i don't code, i don't print, i don't weave, i don't paint, i don't draw.....like most people, i'm glued to my screen. it feels like i never work, it feels more like waiting. the work appears and then i wait again, for the next one. 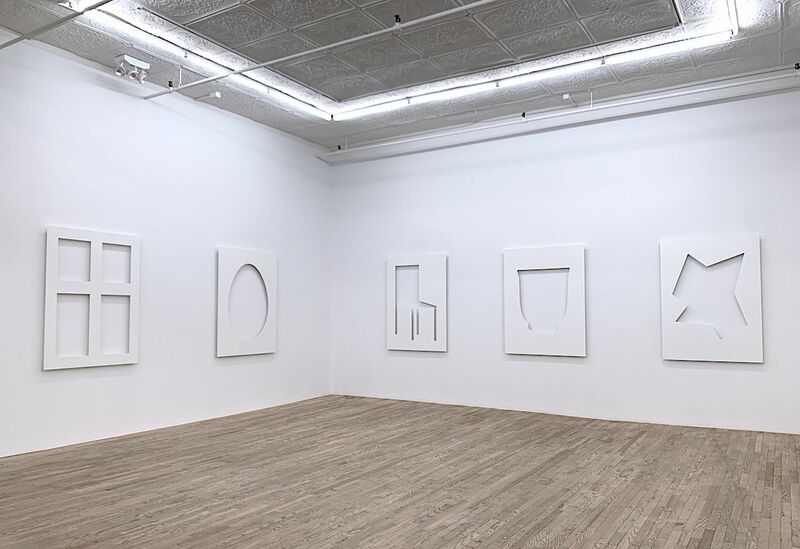 Don’t Do Too Much is at Postmasters, 54 Franklin Street, New York, NY 10013 from 12 January to 23 February 2019.